The Round Octopus Wooden Shield is a difficult shield to beat. Not only is it hand-crafted to ensure the highest level of detail, it is a superb shield crafted from quality materials that make it as decorative as it is functional. 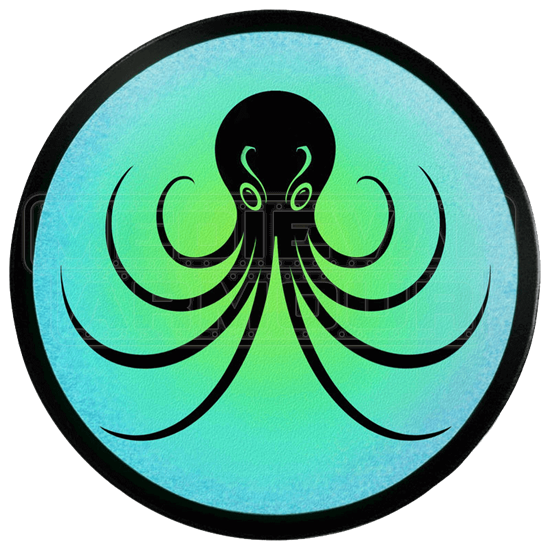 This full-sized wooden shield features an octopus design that has been hand-painted over an airbrushed greenish-blue background. The octopus, rendered in black, is highly stylized, with its appendages fanning out beneath it and curling around, to create a larger, more impressive silhouette. The border of the shield is black. With a diameter of approximately 25 inches, this shield cover your warm way past the elbow, and will work wonders as an actual shield in protecting your body from attack and harm. The shield is made from smooth composite wood, which offers more strength and durability than conventional plywood. The back of the shield features dual leather straps which provide a secure and comfortable way to carry and wield the shield. One leather strap wraps around the forearm while the other is gripped firmly by the hand. The front, painted surface of the shield has also had several coats of varnish applied to it in order to offer extra protection against the wear and tear that the shield may experience as time goes by. This shield is perfect to take to an upcoming Renaissance fair, and it also makes for a great gift. Of course, as a functional shield, the Round Octopus Wooden Shield can also be used during sparring practice.